Actors and TV Personalities: Do they make good Presidents? Russia's recent military buildup in Syria has perplexed the Obama administration and left it in a quandary as to how to respond, left it in a quandary as to how to respond, left it in a quandary as to how to respond, left it in a quandary as to how to respond, left it in a quandary as to how to respond..
With the greatest power on earth run by Bozo the Clown, we can expect just about anything in the Middle East. The GCC and Egypt now have ground troops in large numbers in Yemen, Turkey has sent troops into its puppet Kurdish statelet in Iraq, the Aussies have gotten into the bombing action in Syria; and Russian and Iranian troops are pouring into Syria. Hundreds of thousands of Muslim invaders, meanwhile, are pouring into Europe. If we had a credible leader in the White House, this would not be a difficult matter to deal with: Washington would call the shots, and the rest of the world would get in line whether they liked it or not. Because Bozo gets into a fetal position in the corner every time something changes in the world, though, the rest of the world's leaders realize that they have to take the bull by the horns themselves, and let the chips fall where they may. The Russians and Iranians have done this in Syria, where they run the risk of clashes with Israeli aircraft pursuing Hizbullah terrorists -- not to mention American and Australian planes on futile missions against the Islamic State. It will be a small wonder, if the UK and France & friends do not get involved as well; because their citizenry is about to raise a hewan cry to DO SOMETHING about the refugees, and their migrant and terrorist companions, flowing into Europe and overwhelming the place. Ronald Reagan was born 6 Feb 1911, and was inaugurated in Jan. 1981 at age 69 yrs. 11 mos. -- a record age for a newly-elected President. On inauguration day, 2017, Hillary will be 69 yrs. 3 mos. and Trump will be 70 yrs. 7 mos. Whoever gets elected, they will be the last Baby Boomer President. By the time re-election time rolls around in 2021, Baby Boomers born in 1956 will be turning 65, and those born in 1957 will be turning 62. No matter who is in office, the income gap between CEOs and median wage-earners in the US will continue to widen, housing prices should go up and put homes more out of reach to citizens, student loans should charge higher interest rates, and our younger generations should be seeing more competition for jobs from robots, Mexicans and, if the Democrats win, Muslims. Can our next President address this problem, and simultaneously deal with Chinese expansion, an absolutely lunatic Middle East, Africa in renewed chaos and Europe struggling to stay together? Donald Trump seems to think he can. Ben Carson is the darling of the Tea Party at the moment; and unlike 2012, I don't expect the mainstream media to eat him for breakfast like they did one TP candidate after another in the last election. That's because they're scared stiff by The Donald, and have all their guns aimed at him. Even so, the average voter considers Trump to be boastful but HONEST, while they judge Hillary to be deceitful but a liar. To what shall I compare the coming election? 1980 comes to mind, when US Embassy employees in Iran were being publicly humiliated by their captors during the administration of Obama's twin brother, Jimmy Carter. He was roundly beaten by a septegenarian actor, who turned out to be a capable leader. Can TV personality Trump fill Reagan's shoes? We won't know, until he moves into the White House. What we've seen so far is unabashed showmanship, something which is pushing the mealy-mouthed, politically correct midgets running against him into the peanut gallery. Hillary's ratings, meanwhile, are going, as one commentator put it, drip, drip, drip onto the floor. By the way, Ben Carson has a few enthusiastic backers, but no money. The money's all on Hillary and Jeb at the moment, who make two holes in drain cover. As I see it, the only one who can stop Trump now, is Joe Biden, who will turn 74 just after election day -- older than Reagan was when he started his second term. This is a very crass comment, but I wonder if America can forget its troubles. as its Chief of State comes down with Alzheimer's. That's not a good prognosis for the next King of the World. We can only hope that the man who has been acting like a clown during the campaign so far, and do better than the Bozo who acted like a professor during his campaign, only to turn out to be a Bozo. P.S. Is it just me? 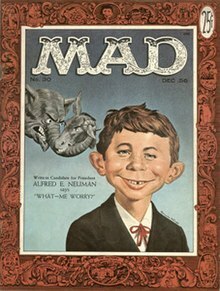 or does Barack Obama look like Alfred E. Neuman?